Vato Kavtaradze is Founder and CEO of one of the leading innovative advertising agencies in Georgia, Windfor's Advertising. 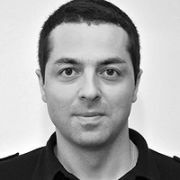 Prior to establishing Windfor, Kavtaradze was Creative Director at Kedi TV/McCann Erickson and Advertising Director and Copywriter at AA Mimino/Studio Audience in Tbilisi. Kavtaradze began his career as a journalist and has worked on projects funded by the World Bank and other NGOs.